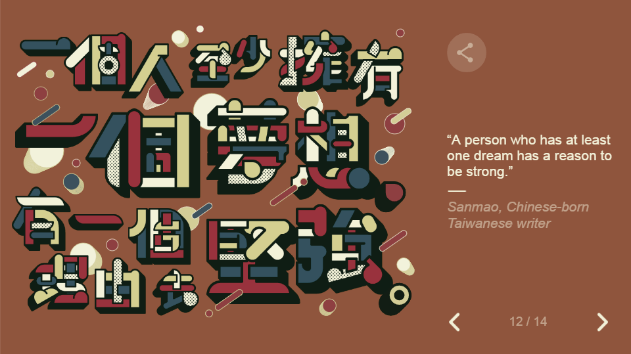 For International Women's Day, Google made one of its doodles — this one with quotations from various women from around the world. Each is given its own distinctive typography. Several languages and scripts appear. The ones with Hanzi / Kanji, however, are perhaps especially worthy of note, if only for how very different they are from how Mandarin and Japanese normally appear, even in decorative contexts. Those two were illustrated by Japanese graphic designer Hazuki Tamano, according to this page. 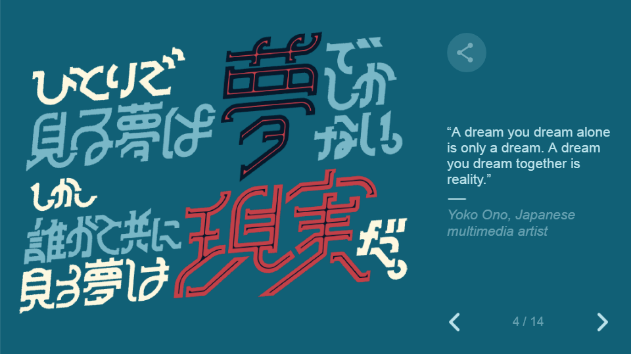 I'm curious how well Japanese can read the Yoko Ono quote as presented. To my (mildly trained) eyes, the latter is eminently readable (although the る in the second 見る would be unrecognisable out of context), but the former is more laborious (particularly with the final 個). It's notable how in both examples the letterforms vary character to character, line to line, which made me second guess myself a couple of times. The Japanese quote is slightly difficult to read just because the order of the characters is not strictly linear, but the characters themselves are mostly easy to recognise. Some of the shapes are indeed very unusual, particularly of る in both instances of 見る, but the human brain easily compensates for this with contextual information. I find the Mandarin hanzi a lot harder to read due to the visual noise and coloring breaking up the shapes, as well as tripping up on the grammar. Some of the typographical details there are really interesting. I’m not a native speaker of Japanese, but I had no problems reading the quote. I somehow managed to read the English as "Go Ogle". How sexist of me! The selection of colors for writing was very bad and difficult to read! I’m a native Russian speaker and I had a hard time reading the Russian, honestly. Non-native, but I found the Japanese one mostly easily legible. The only one that threw me for a loop was 誰かと共に, because the と looks more like て. @Davis Morris: The same in Dutch. The Dutch word 'vrouw' is used for both 'woman' and 'wife'. "3:16 Bible Text illuminated" book. Google that and "calligraphy" and you can see some examples. When I first encountered Google way back when, I did wonder if "go ogle" was the etymology. German also combines "woman" and "wife" as Frau. Possibly interestingly, in Swedish man is both "man" and "husband", but there's no similar syncretism between "woman" (kvinna) and "wife" (fru).